Spring has finally sprung!!! After a cold, wet, and wintry April, that we sometimes thought would never end, its been very much like summer here for the last week or so. Hopefully winter is finally gone. Fingers crossed!! We’re seeing some tulips blooming, our peonies are just bursting out of the ground, and the lilacs are budding. Just fantastic weather!!! And finally I was able to work on a project outside. What a treat!! I almost forgot how good that feels. 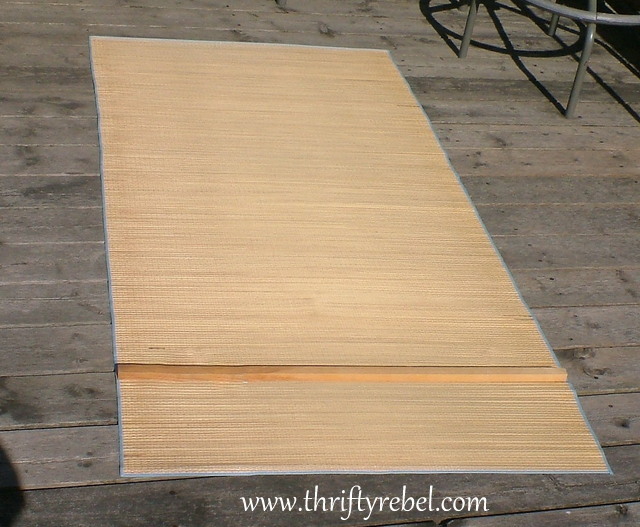 Last summer I bought 3 beach mats for $1 each at a garage sale. 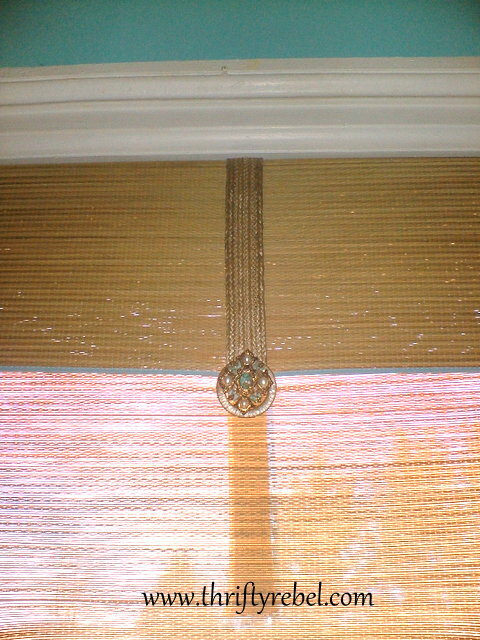 They were the perfect size for the upstairs windows, so I decided to use one as a blind in the guest room. Here’s a sneak peak at the finished blind. 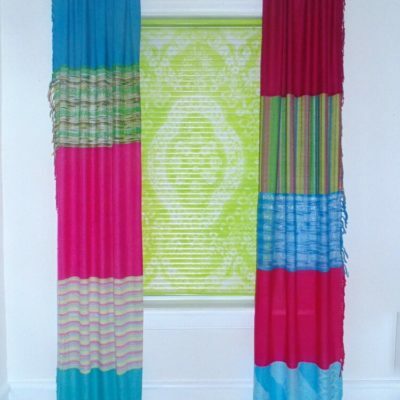 We had one of those basic roll up blinds in the window before. Great for keeping out the light, and the heat of the summer sun, but that’s about it. The beach mats came with the blue edging. Perfect for the guest room. They measured about 36″ wide x 72″ long. The height of the guest room window is 60″. 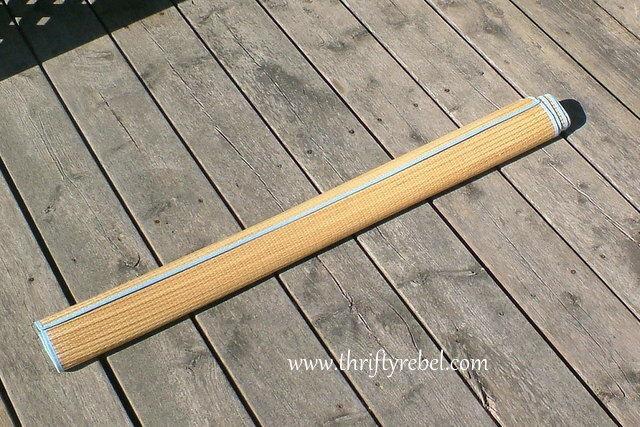 I laid out my beach mat, measured to the 59″ mark, and placed a 1″ x 1″ piece of lumber at that spot. This will leave a valance of about 12″. 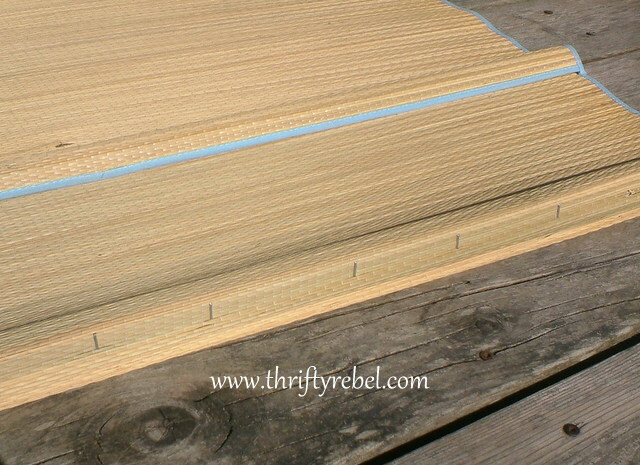 I folded over the valance portion, and used my staple gun to attach the beach mat to the piece of lumber. I laid it back out and predrilled two screws into the 1×1. 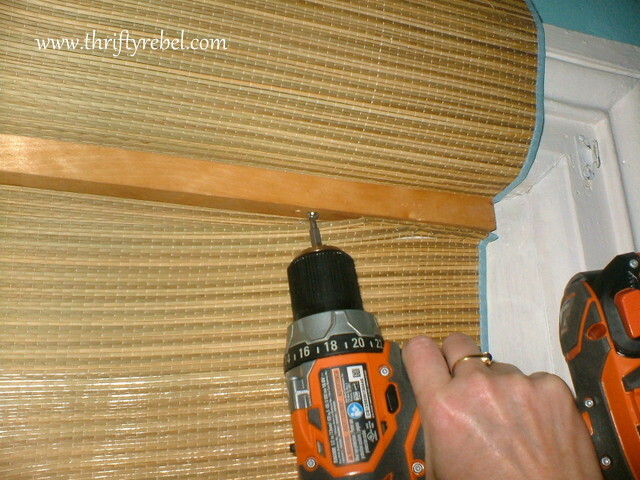 I held the beach mat in place and drilled the screws into the top of the window. 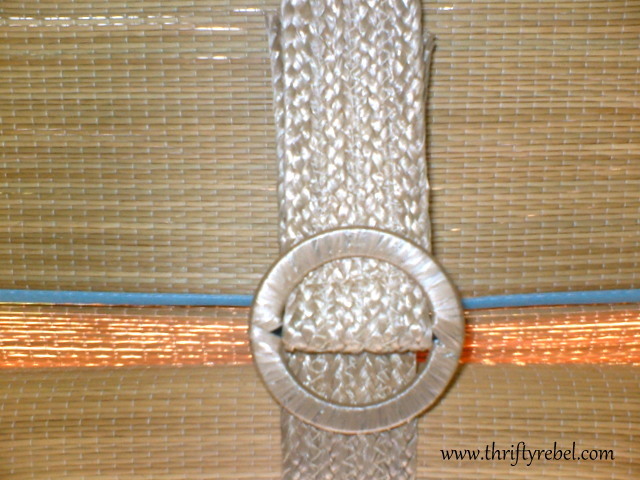 I wanted something to hold up the blind when it’ll be open, and this straw belt that I found at the thrift store for $1 fit the bill perfectly. 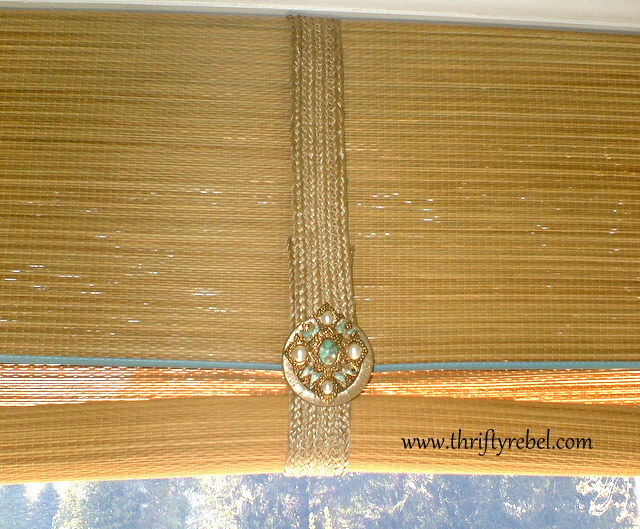 I slipped the belt over the top of the blind, and then finished tightening the screws. The belt was way too long so I cut it where I needed to. I used my glue gun to seal the edge of the belt where I cut it so it won’t fray. Then I added some adhesive velcro squares that I had on hand to the back of each end of the belt. To pretty it up a bit I added this thrifted $1 brooch. 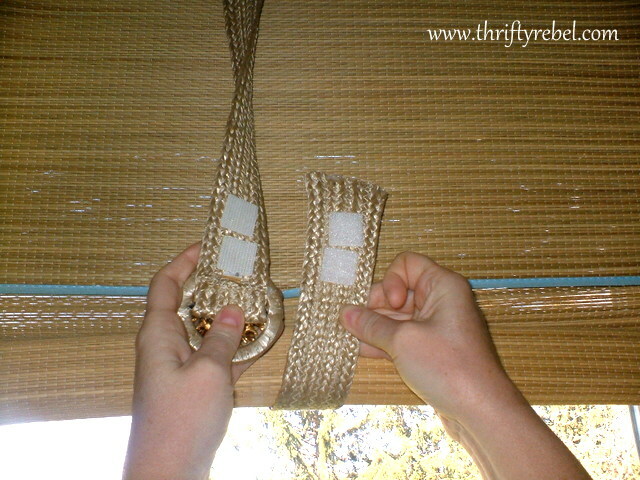 The blind can either be rolled up nice and neat, or simply pushed up with my hand, before securing the velcroed belt to hold it in place. So, for about $3 I have a nice new blind that goes perfectly with the French Caribbean theme of the guest room. And it was sooo easy!! I really love the look, and even though the blind is very light it really does keep out the heat of the sun. That’s always an issue here in the summer because we don’t have central air. 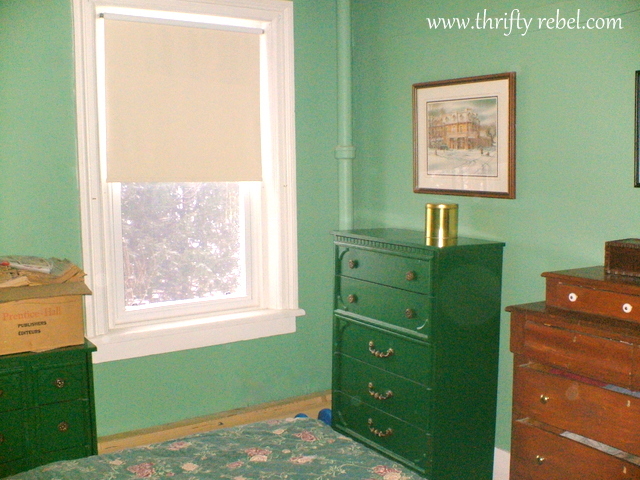 A few months ago I returned to permanent full-time hours in my day job, after working part-time for about 8 years, so my guest room makeover slowed down for a little while. But I’m happy to say that I’ve recently made great progress, and I’m now ready to begin posting new projects from this makeover. This is just the first! So stay tuned! I love it! It looks fantastic and that brooch is perfect too. 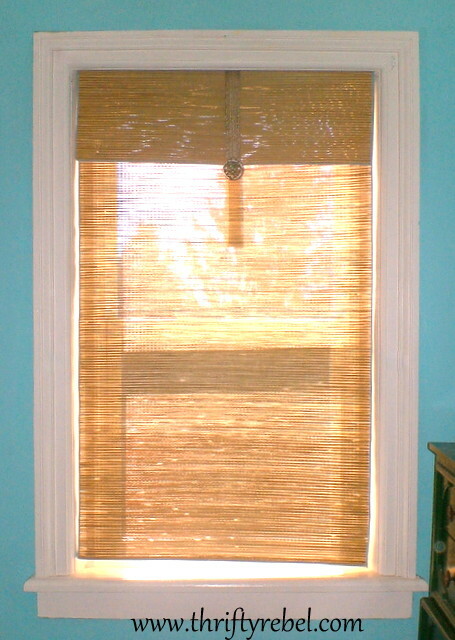 What a great idea Tuula – love it – I love bamboo blinds anyway for the way they filter light into the room. What a wonderful idea. Great job! Tuula, you are so clever and creative in coming up with wonderful ideas for your thrift finds. This is adorable and SO French Caribbean! Gosh, I think I see a bit of sun back behind the beachy blind. Now I am very interested to see what French Caribbean will turn out to be. The brooch adds a touch of elegance to the straw shade. 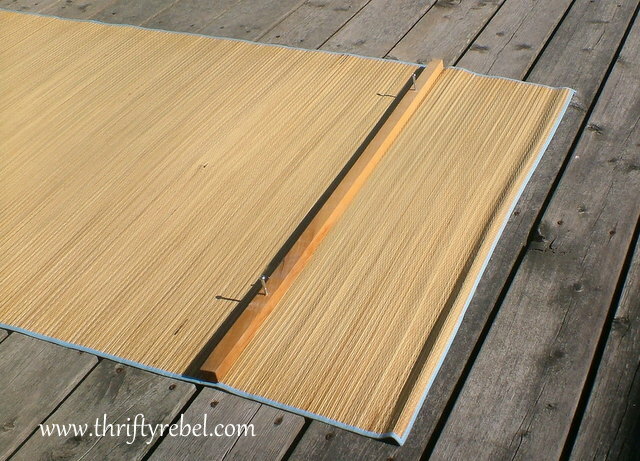 What a wonderfully creative idea…I will be on the lookout for beach mats and old belts while thrifting. How clever is that! Love the look and the price. I'm pinning. Back to working full time and still have time to blog and craft. I am impressed. What a wonderful blind. 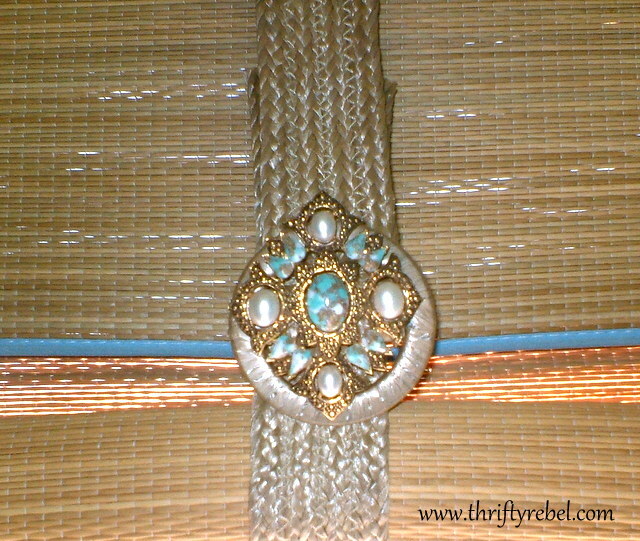 I love that you used a belt and added some bling with the vintage brooch. Okay…I zeroed in on "no central air" and passed out. 🙂 I thought I was already following you…what chaos!…I am now!! What a great idea! Thanks for sharing at Fluster's Creative Muster Party! Very creative project! I love how you repurposed all these different items. Thanks for sharing! You are a genius! That is a STUPENDOUS Idea!!! Thank you so MUCH for sharing that….It is very inspiring. Oh so very creative! Thank you for linking up with Rustic Restorations Weekend! What a cool idea! Thank you so much for sharing at last week's All My Bloggy Friends 🙂 I can't wait to see what you share this week! Beautiful idea! How do you come up with all of these wonderful projects? Thanks for sharing at Tuesdays wit a Twist! That is a good idea, but I still think that classiccordless integral blinds also look good here.